Searchkska.xyz is the PUP that uses misleading techniques to prevent removal. Use Reimage to locate malicious components and get rid of them faster than with uninstall instructions. A full system scan blocks virus reappearance and prevents traffic to malicious domains. Searchkska.xyz virus is a version of Trovi browser hijacker that meddles with browser’s settings without user’s knowledge. Typically, SearchKsKa browser hijacker changes homepage address to hxxp://Searchkska.xyz/ and sets the same URL as default search provider. The presence of this program is intolerable, so you should remove it from your PC as soon as you can. 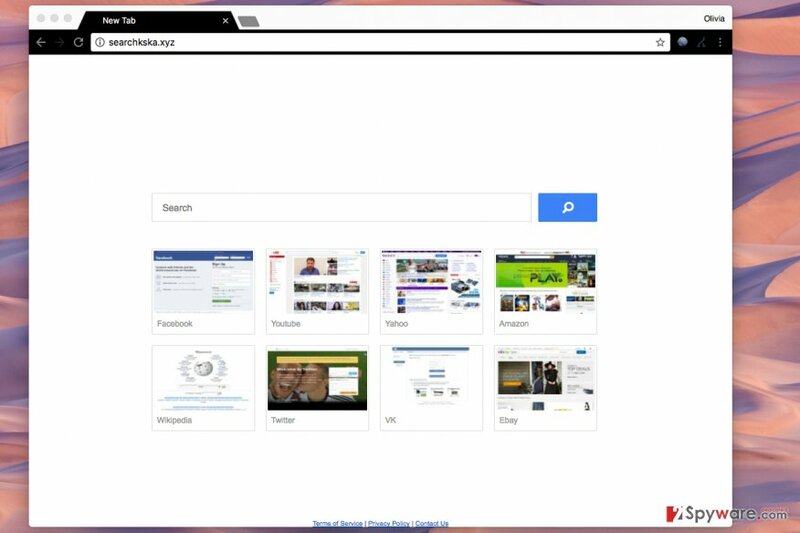 Searchkska main page reminds a simple browser’s default page – it is entirely white, has a search box on it, and eight shortcuts to popular websites such as Facebook, Youtube, Yahoo, VK, Twitter, Wikipedia, eBay, and Amazon. Although these shortcuts are trustworthy, the search engine isn’t. After making a search query via this search engine, the search query will be sent to trovi.com first, and only then the victim receives Bing search results. However, it is believed that these search results can be altered and filled with untrustworthy links leading to Trovi’s affiliate sites. The bogus search engine causes URL redirections to drive traffic to particular websites and this way it functions as a tool that generates revenue for SearchKsKa developers. Unfortunately, our experience shows that results brought by such vague search tools are not trustworthy. They may contain links that throw victims onto dubious sites asking to participate in scam surveys or install shady freeware. Even if you find some relevant information through the discussed search tool, you shouldn’t count on it at all times. Another reason to remove SearchKsKa.xyz virus is the fact that it replaced your browser’s settings without your knowledge. The method used in its distribution is not considered illegal; however, it is very annoying. On top of that, we must add that the hijacker silently tracks victim as a user – it doesn’t target personally identifiable information, but it seeks to collect one’s IP address, search queries, browsing history, downloads, clicks, URLs of favorite sites and related information. If you’d like to keep such information private, initiate SearchKsKa.xyz removal in the near future. If you can’t uninstall it from the system, allow Reimage or Plumbytes Anti-MalwareMalwarebytes Malwarebytes help you with that. In case you are determined to delete the hijacker manually, follow SearchKsKa.xyz removal guidelines we provide. Our research shows that this browser hijacker rampages in US and France mostly. If you are a French-speaking computer user, we invite you to visit LesVirus.fr site, which provides cyber security tips in your language. Searchkska.xyz is a modified version of Trovi browser virus. In fact, it sends all victim's search queries to Trovi.com before landing the victim on Bing's search results' page. Sadly, the majority of computer users install browser hijackers without realizing how dangerous these programs can be. Users often overlook statements about additional programs that will be installed alongside the main program, usually because they do not bother themselves reading information written in fine print. Download the software from legitimate web sources only. Do not rely on shady and untrustworthy Internet sites full of ads and misleading download buttons. Do not rush during the installation of your chosen software. We strongly advise you to select Custom or Advanced option to install your download. Usually, these settings expand and provide the user with a list of extra software. The user then can choose which programs he wants to install and which ones he’d like to reject. To prevent this browser hijacker from redirecting you to strange Internet sites, remove Searchkska.xyz virus today. You shouldn’t delay this task because this potentially unwanted program can put your privacy and security at risk, even if it is not malicious itself. If you or your relative decides to use Searchkska as a search tool, the probability of visiting a doubtful Internet site skyrockets. If this browser hijacker changed your browser’s settings and now you do not know how to fix them, use Searchkska.xyz removal tutorial we provided. Clearly, you can use an automatic spyware removal software to complete this task easier. Uninstall all Trovi-related components – Search Protect, Searchkska, Conduit, Trovi and other suspicious programs from the system. Then, follow the provided instructions to clean compromised browser shortcuts. You must delete hxxp://Searchkska.xyz/ from them. Here, look for Searchkska.xyz or any other recently installed suspicious programs. Wait until you see Applications folder and look for Searchkska.xyz or any other suspicious programs on it. Now right click on every of such entries and select Move to Trash. When in the new window, check Delete personal settings and select Reset again to complete Searchkska.xyz removal. Once these steps are finished, Searchkska.xyz should be removed from your Microsoft Edge browser. To fix Firefox, you must remove Searchkska add-on from it. We also highly recommend deleting other vague extensions that you haven't installed by your choice. Here, select Searchkska.xyz and other questionable plugins. Click Remove to delete these entries. Now you will see Reset Firefox to its default state message with Reset Firefox button. Click this button for several times and complete Searchkska.xyz removal. Delete Trovi extension, also Search Protect, Searchkska, and other dubious Chrome extensions. To find all of them, use the provided guidelines. Here, select Searchkska.xyz and other malicious plugins and select trash icon to delete these entries. Click Reset to confirm this action and complete Searchkska.xyz removal. Here, select Extensions and look for Searchkska.xyz or other suspicious entries. Click on the Uninstall button to get rid each of them. Here, look at the Homepage field. If it was altered by Searchkska.xyz, remove unwanted link and enter the one that you want to use for your searches. Remember to include the "http://" before typing in the address of the page. Now you will see a detailed dialog window filled with reset options. All of those options are usually checked, but you can specify which of them you want to reset. Click the Reset button to complete Searchkska.xyz removal process. ^ Watch out for the latest in browser hijackers – Qtipr.com, Motious.com and Launchpage.org. eSolutions. IT Security News. ^ LesVirus. LesVirus. Malware Removal Tutorials, IT Security Tips. This entry was posted on 2017-07-28 at 06:24 and is filed under Stealing programs, Viruses. You can quickly scan the QR code with your mobile device and have Searchkska.xyz virus manual removal instructions right in your pocket. How did you remove Searchkska.xyz virus?